SACRAMENTO – State officials around the country are using state and local budget woes as a smokescreen for campaigns against public unions and their workers, a top California state official says. In a telephone press conference, hosted by the Economic Policy Institute, California Treasurer Bill Lockyer (D) said if those pols succeed, the cuts would devastate not only workers but services. EPI scholars added the devastation would spread to the private sector, imperiling the fragile recovery from the Great Recession. Budget data show states face cumulative deficits of $235 billion combined in 2011-12, with the biggest problems in California and Illinois. Since states, except Vermont, must balance their budgets yearly, governors of both parties have been eyeing public workers’ salaries and pensions for cuts. Lockyer says that’s wrong: The two big drivers of state deficits, he said, are escalating health care costs and what analysts say is a 31percent collapse in state revenues due to the recession. And many of the officials who are campaigning against public workers’ pay and pensions – he didn’t name names – really have an anti-union agenda. Several right-wing think tanks have also suggested states declare bankruptcy, as yet another way to escape obligations – including union contracts. Lockyer turned that down flat. “Behind that is an attack on state workers,” he said. “This is all fiction and all speculative,” he said of the right-wing arguments. The American Federation of State, County and Municipal Employees and other unions that represent public workers are responding by citing the need for state and local services, especially in a recession, where the unemployed turn to states for aid. They also point out those services – schools, hospitals, fire departments, police, corrections officers, road work – are not only essential but put money in workers’ pockets. That led EPI analyst Ethan Pollack to agree that advocates of cutting state and local workers’ pay “are more about scapegoating state and local government workers,” and unions than about cuts. “Studies show state workers, with comparable education and experience and in comparable jobs, earn 6.8 percent less than their private counterparts. 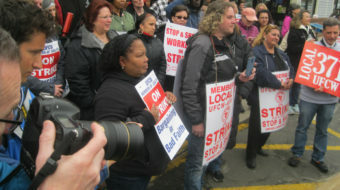 Local workers earn 7.4 percent less,” Pollack said. still far below their levels of several years ago, legislatures and governors – though not in California, Lockyer hoped – often look solely at budget cuts to balance the books. That would include worker cuts, pension cuts and program cuts, he said. “It’s not like you’re cutting one account and X number of jobs,” if that happens, he elaborated about his state’s looming $28 billion deficit, which Gov. Jerry Brown, D-Calif., and the legislature are tackling. “It’s a question of do you cut the $9.50-an-hour home health care aides” – who are now unionized in California – “who help keep people in their homes and out of nursing homes.” Other questions include whether the University of California system would lay off workers or impose another huge tuition hike and what would happen to education aid to local governments, which is roughly half the state budget. “If that gets cut, maybe 40,000 teachers get laid off, the schools shut down for several weeks and the cafeteria workers go home without paychecks. It’s a question of cutting 500,000-600,000 state and local jobs, and that’s a lot in California,” he said.